Amlodipine is a long-acting 1,4-dihydropyridine calcium channel blocker. It acts primarily on vascular smooth muscle cells by stabilizing voltage-gated L-type calcium channels in their inactive conformation. By inhibiting the influx of calcium in smooth muscle cells, amlodipine prevents calcium-dependent myocyte contraction and vasoconstriction. A second proposed mechanism for the drug’s vasodilatory effects involves pH-dependent inhibition of calcium influx via inhibition of smooth muscle carbonic anhydrase. Some studies have shown that amlodipine also exerts inhibitory effects on voltage-gated N-type calcium channels. N-type calcium channels located in the central nervous system may be involved in nociceptive signaling and pain sensation. 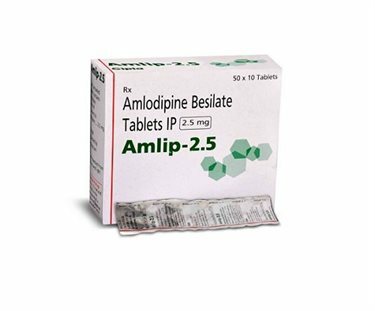 Amlodipine is used to treat hypertension and chronic stable angina.